The year is 1941. The country, Germany. What Frau Pabst doesn’t know—what the director can’t bring himself to tell her—is that her son is dead. He was killed as part of Aktion T4, the Third Reich’s program of involuntary euthanasia targeting “lives unworthy of life,” in the Nazis’ phrase. This nearly unbearable scene appears in “All Our Children,” a drama showing at the Jermyn Street Theatre in London’s West End. The setting, plot and most of the characters are fictional. But the historical background is factual. “All Our Children” presents a gripping theatrical account of the Nazis’ project to liquidate the disabled—and one Catholic prelate’s struggle to thwart it. Galen, born into an aristocratic family, initially made peace with National Socialism. He saw it as an antidote to the humiliation of Versailles and the moral decay of Weimar. He was quickly disillusioned. Nazism was a dangerous “pagan” ideology, he wrote in a 1934 pastoral letter. The bishop’s ecclesial stature and moral gravitas made him difficult to silence. One criticism of the bishop, not entirely unfounded, is that although he went to great lengths to defend the church against Nazi anti-Catholicism, he didn’t speak out nearly as forcefully against hatred of Jews. His primary objection to the superintendent’s decree, for example, was that it violated the 1933 concordat between the Vatican and Berlin that protected the church’s independence. A less fair criticism is that his resistance was too passive. Galen was in no position to take up arms. His best weapon was his homilies. Of these, the most consequential was delivered on Aug. 3, 1941. It concerned the T4 program. He went on: “Poor human beings, ill human beings, they are unproductive, if you will. But does that mean that they have lost the right to live? Have you, have I, the right to live only so long as we are productive?” The Nazis couldn’t erase “Thou shalt not kill,” he said, because it was written on the heart. In the play, Galen visits the clinic to help the medical director see the light. The essence of Christianity, he says, is to recognize Jesus in the suffering of the weak and vulnerable. Though the director is an atheist, something about this holy man moves him to defy his SS superiors and stop the killing, at least briefly. That part is pure fiction. Yet shortly after the bishop’s homily in 1941, T4 was terminated. By then 70,000 to 100,000 innocents had been murdered. Another 100,000 people with disabilities would be killed before war’s end, albeit in a less systematic fashion. It’s hard not to hear some discomfiting contemporary notes in the play. Nazi crimes remain without parallel, but some European countries today boast 100% termination rates for fetuses with Down syndrome. Others allow voluntary euthanasia for patients with an ever-growing list of nonterminal conditions. Not even the Catholic Church is immune. Lay officials at the Brothers of Charity, a Belgian religious order, plan to permit nonterminal mentally ill patients to be euthanized in the order’s hospitals—over the brothers’ objections. Belgian law prohibits health-care facilities from refusing to allow euthanasia on conscience grounds. Violators risk fines and damages. That’s nothing compared with what Galen faced. The Nazis placed him under house arrest in late 1941 and considered hanging him before deciding against it, fearing a popular backlash in Münster. Galen survived Hitler. 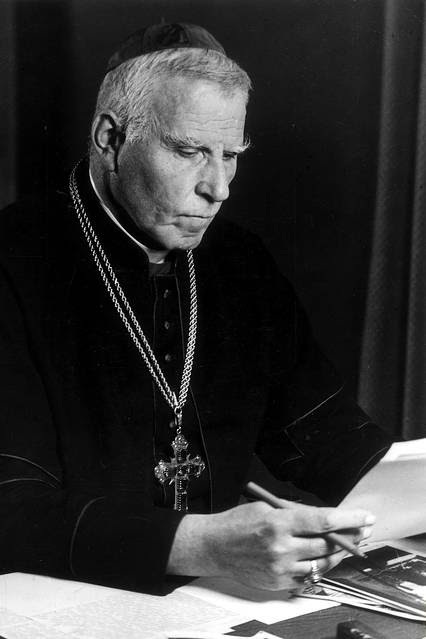 He was created a cardinal on Feb. 21, 1946, in implicit recognition of his anti-Nazi stance, and died a month later. Pope Benedict XVI beatified him in 2005. The Lion of Münster’s episcopal motto was nec laudibus nec timore—neither by flattery nor by fear. Mr. Ahmari is a Journal editorial writer in London. Appeared in the May 19, 2017, print edition.